Gas consumption in Lithuania is decreasing, but in order to maintain expensive infrastructure the state will have to encourage energy production from gas, regardless of price. Rapid technological development has resulted in wind turbine generated energy being several times cheaper than that of gas powered power plants. As paradoxical as it may be the chief obstacle to developing local wind energy generation is the hundreds of millions invested into energy based on imported fossil fuels, Lietuvos žinios reported. According to European Commission data Lithuania has some of the best conditions for the development of renewable energy in the European Union, furthermore local electricity transmission infrastructure is well developed. However currently the country only produces 20% of the energy it consumes. Lithuania has dumped hundreds of millions of euro into gas infrastructure working at partial capacity – the liquefied natural gas terminal and the gas powered Lithuanian power plant combined cycle bloc. In order to maintain them millions of euro are invested, paid for by the energy consumers. Furthermore the gas link between Lithuania and Poland is beginning construction and it will demand vast investment as well. Meanwhile gas consumption in Lithuania is decreasing, thus in seeking to maintain the expensive infrastructure Lithuania will have to encourage increased consumption of the imported gas and electricity production from gas, though without government subsidies gas powered power plants can no longer compete with electricity imported from not only Scandinavia, but also with local electricity from renewables. Of this 6 million euro is EU funding. During an interview with Lietuvos Žinios Minister of Energy Žygimantas Vaičiūnas admitted recently that the current situation where up to 80% of Lithuanian electricity consumption is imported is not particularly good in terms of national security. The minister pledged to encourage small scale distributed generation, so that every consumer could also become a producer of energy in order to help local production gradually replace that which is imported. The largest producers of renewable energy also support increasing energy independence, with Lithuanian Wind Power Association council member Tadas Navickas stressing that recently both solar and wind energy production has greatly risen in efficiency recently and with rapid technological development it is hard to predict just how far these increases can go. Nevertheless the producers of renewable energy recommend a gradual increase in the contribution from renewables, while monitoring changes abroad. “Over a few years we could raise the amount of electricity produced in Lithuania from 30% (of which 20% is from renewables) to 45% (of which 30% would be from renewables) of total consumption. After four years we could review available technology and prices and move forward,” Navickas said. He however laments the unmeasured investment flowing into gas infrastructure, pointing to the former Minister of Energy Rokas Masiulis’ strong support for the LNG terminal and ongoing pushes for the Lithuanian-Polish gas pipeline, as well as plans for further gas infrastructure. The European Commission has accepted the claims of Lithuanian officials that the country’s gas demand is 4 billion cubic metres of gas per years, while the real demand may only reach half of the amount and is continuing to decrease, likely dropping to 1.7 billion cubic metres by 2019. Meanwhile the LNG terminal is working at an eighth of its capacity with more than half of imported gas originating in Russia. T. Navickas notes that in the short term gas and renewables complement one another and with priority given to renewable energy, gas powered plants could step in to extend capacities where renewables are insufficient. Unfortunately he notes that in Lithuania the opposite is being done, with renewables being used as the ancillary energy source, while the world is moving toward generating 100% of its energy from renewables by 2050 or later. Renewable energy production company Vėjų Spektras Director Alvydas Naujėkas told Lietuvos Žinios that the breakthrough in renewable technologies occurred in 2011-2012, when the cost of wind power plants stopped increasing and began to fall. He notes that investment costs in renewables are decreasing by 5-6% annually and that gas based power is already three times as expensive as wind based. The Lithuanian model of supporting renewables is based on government support for the first 12 years or the period it takes for the investment to pay off. The investment is subsidised from the Public Interest Coinciding Service (VIAP) budget. T. Navickas stressed that Lithuanian renewables are not competing with local production, but rather that from Russia before and now from Scandinavia and that it needs support only because production from Scandinavia is cheaper. He explains that no branch of electricity generation can do without subsidies, given competition with well-established and earlier subsidised rivals. Furthermore the price of electricity is decreasing along with demand (except in Lithuania), making for a difficult competition environment. The Lithuanian Wind Power Association council member concludes that there are only two choices for Lithuania – either import electricity or construct the cheapest available power plants, namely wind power plants and that it is not enough to only subsidise renewable energy until it pays off, but rather for extended periods due to current market conditions not permitting real competition. The Klaipėda LNG terminal opened in 2015 is unique in not only being one of the most expensive, but also in that it was built exclusively through government funding without any EU or private investor support. Its rent will cost Lithuania 695 million euro over ten years, costing consumers over 80 million euro annually. Meanwhile the Lithuanian natural gas transmission system operator Amber Grid has announced that the maximum EU support for the Gas Interconnection Poland–Lithuania (GIPL) project will be 58 million euro, while the total value of the project will be 558 million euro, with investment in Lithuania being 136 million euro. The costs should be reduced when the Polish partners conclude their opportunity study this summer, but the costs for Amber Grid will likely remain the same, totalling 78 million euro. 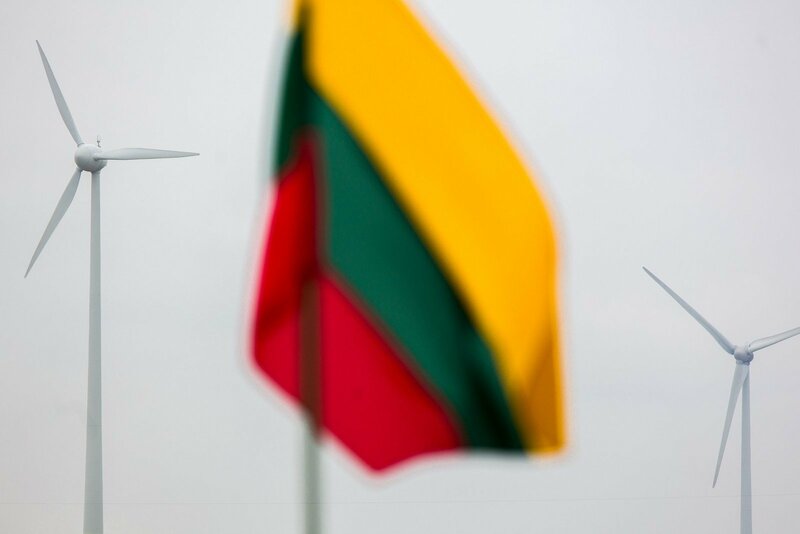 Producers of renewable energy note that the first wind parks constructed in Lithuania will cease receiving support in 2019-2020. T. Navickas notes that with the construction of new power plants generating an extra 350 MW electricity, the amount of support needed would decrease from 18 to 11 million euro, reducing the price of electricity while doubling wind power contributions. He nevertheless notes that discussions on national energy strategy have so far been held behind closed doors, with discussions simply imitated and powerful gas industry interests winning out. Navickas expressed hope the new minister will act otherwise. A. Naujėkas reminds that the new minister has spoken in public about Lithuania turning toward energy production centralisation and encouraging the expansion of small scale domestic energy generation. Naujėkas notes that this would allow to avoid electricity price fluctuations even when fossil fuel prices fluctuate and that Ž. Vaičiūnas is the first Minister of Energy to officially pledge such positive shifts. **A contribution of 168.2 million euro was provided by the Ignalina International Decommissioning Support Fund. ***Of this 136 million euro is funding from Lithuania (of it 58 million euro EU support).